Great for finishing basements and garage floors or patching and repairing on larger jobs. The PT-36 has a diameter of 36 inches (92 centimeters) for smaller concrete slabs and hard to reach areas where your ride-on trowel cannot go. 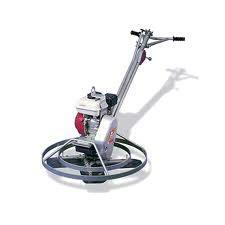 * Please call us for any questions on our power trowel 36in gas rentals in Kokomo IN, Logansport, and Central Indiana.